Beautifully Appointed Townhome, Walk to Town! 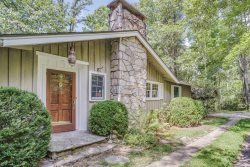 This home has it all: easy access to town, ample parking, an attached garage, a screened porch with stone fireplace, plus a covered deck. And that is only on the outside. Inside, the kitchen is open to the greatroom and boasts marble countertops with beautiful cabinetry and top of the line Thermador appliances. The greatroom with gas stacked stone fireplace with large flat screen TV above and a dry bar and bookcases along side. DirecTV signal, WiFi, and good cellular reception. The master bedroom is light and airy with a spacious and luxurious master bath. On the second floor is a second master with a private bath. The third bedroom has twin beds with bath across the hall. Also on this upper floor is a sitting area with a 28 flat screen. The rear, main floor porch has a large Weber gas grill...Everything needed for a peaceful time in Highlands! Beds are King, King, Twins. Minimum rental period is 7 nights due to Home Owners' Association restrictions. It was a pleasure working with you and Lori from beginning to end.